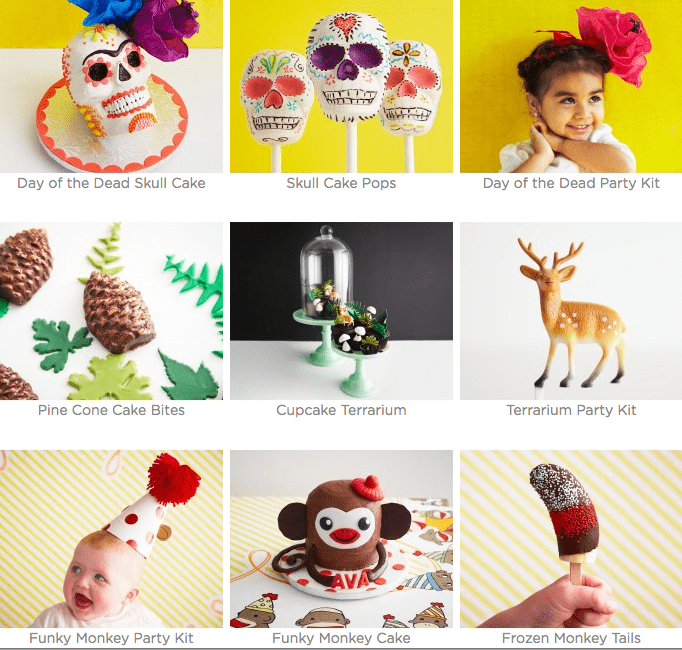 Random site for which I have fallen hard: That adorable picture of our little friend Penelope as Frida led us to the amazing Cake Girls site. Which led me to their stunning party supply shop, which of course led to trouble. 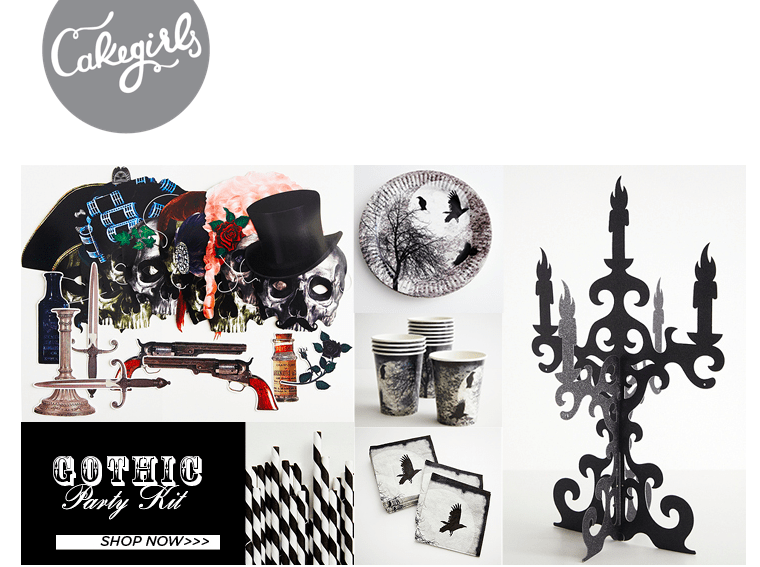 Consider yourself warned, you will be tempted to shop for your next soiree. What’s in the air: Love the smell of something delicious baking in the oven but don’t trust yourself with a whole pumpkin pie? Try one of these sensational simmer pot recipes on the stove and let the beautiful scents of the season fill your home. The easiest baby costumes: I tend to think it’s a right of passage to torture your baby with a first Halloween costume. You, however, might have a soft spot for the little nugget and pick one of these comfy (and creative!) onesie costumes. The best new baby gift: There are a bunch of new babies in my life, yay! 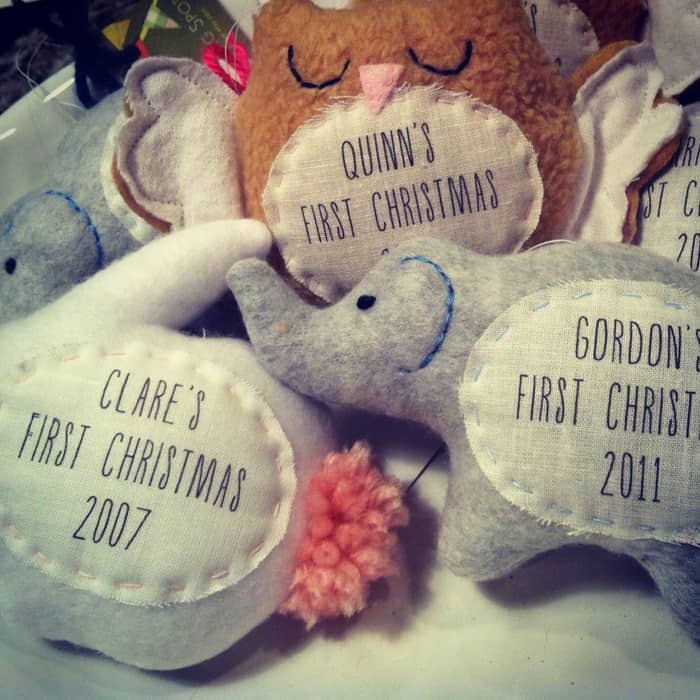 So I ordered a big batch of these adorable ornaments from The Nesting Spot. At $15 each, they are the perfect affordable new baby gift. In the end, I couldn’t resist traveling back in time and ordering a first Christmas ornament for my kids too. In 10 years, no one will know, right? Of course, you can have any customization added, not just First Christmas. The Nesting Spot’s Jocelyn was one of our first readers and I love supporting her handmade business! Love fun baby pics? : Are you hooked on Instagram too? 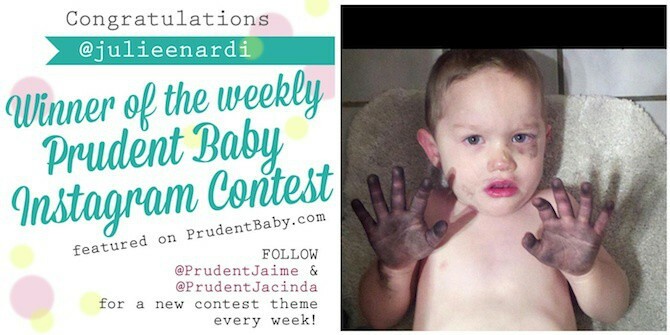 @julieenardi is the winner of last week’s #Messykid contest. He is so serious about his mess making (or he is in big trouble, I can’t tell) ha. 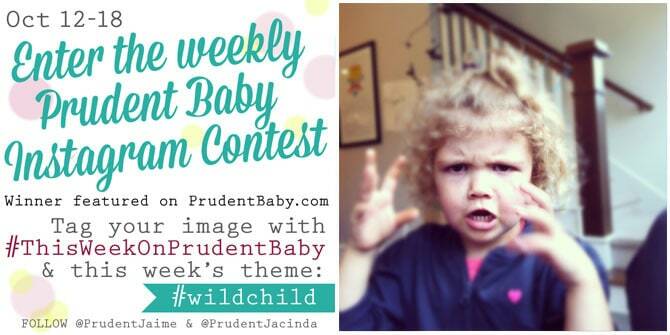 This week’s contest is #WildChild. Just tag your favorite “wild child” photo with #wildchild and #thisweekonprudentbaby and we will pick a favorite and post it here next week! We are loving all of your sweet baby photos. If you havent seen them, visit #thisweekonprudentbaby on instagram and follow @prudentjacinda and @prudentjaime for more instagrammy goodness. Is it that time already? 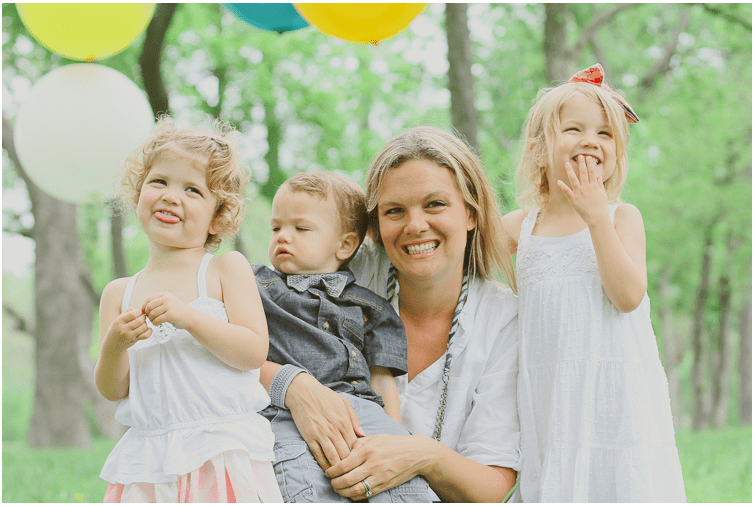 : I am loving “The Mom Stays in the Picture” attitude that is sweeping the internet. Do you find yourself missing in family photos? Well, the one time you should definitely make your way into a pic is for a holiday card. Yes your children are adorable but your friends and family? They want to see you too…. tired eyes, not perfect hair, plus 10 pounds. It matters not. Why not take advantage of the great mini-sessions that local photographers offer this time of year and get a fantastic family photo? I love this picture but hate the way I look in it, my hair is a mess, my eyes have bags but ya know when I won’t hate this picture? in 20 years. I will think I look young and gorgeous and surrounded by my loving babies. Here’s more of our Easter photos. If you are in the Dallas area, Kelly Christine has a mini-session on November 3rd, promising a holiday teepee and other amazing props. Place I’m headed: On Sunday I am off to Jaime’s for a week of shooting for the Prudent Baby YouTube Channel. I will be busy prepping all weekend but I’m so excited to see the Curtis Family and Colleen and make some video magic. Stay tuned for tons of Jacinda and Jaime LA shenanigans! I simply adore you guys and your families. Continued success to love to you all! Love that Cake Girls site, although I am not so sure it was a good idea to find their party shop, could get me into trouble…and BTW if you are looking for a simple homemade pumpkin pie recipe complete with delicious pie dough easy enough for a beginner…try out my latest post. Must resist pumpkin pie recipe before November. Must resist. Hahaha…sorry up here in Canada we just had our Thanksgiving…DELICIOUS! Awesome , can’t wait to see the new videos!